Progress has been made over the years; currently 21% of heads of university are women. However, since women make up 53.8% of the higher education workforce, there are still considerable improvements to be made to reach fair representation at all levels. Our workshop on 7th March followed a similar design to our first workshop on this topic in 2015. You can also find more information on this event series on our diversity and inclusion webpages. 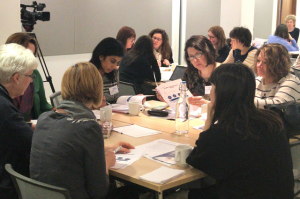 Our Athena SWAN Biosciences Best Practice Workshops aim to support university departments in crafting their applications for an Athena SWAN award through sharing best practice and insights from previous applicants. Through these workshops, we hope to promote the benefits of the award for staff, and help those directly involved in applying for an award. As was the case in 2015, our latest workshop on this theme was organised jointly with our Member Organisations, who have recently come together to form the RSB Diversity and Inclusion Working Group, which launched last year. This event forms part of a programme of activity for the group, which aims to support our member organisations in promoting diversity and inclusion across all their internal and external activities, and to operate as a platform to share ideas and best practice with the biosciences community, as part of our ongoing #BiosciencesForAll project. The event started with a welcome from Dr Pat Goodwin who serves on the RSB’s council as Diversity Champion and represents the RSB on the Athena Forum. The next session began with a talk from Dr Peter Main, head of physics and chair of the Faculty Equality and Diversity Committee at King’s College London. Peter is an Athena SWAN Assessor, and he put emphasis on the need to ingrain the principles of the Athena Swan Charter into the applicant institution, in order to retain full involvement at all departmental levels. This was followed by two interactive workshops run by ECU on creating SMART action plans as part of the Athena SWAN application process, and how to incorporate qualitative data into an application. Next, two case studies from different universities were presented, describing individual experiences of applying to Athena SWAN. For example, Dr Lucy Jones from Kingston University explained how she had recently led the application for the first departmental award at her institution. This session gave attendees a chance to to discuss successful approaches and common pitfalls, challenges, solutions and benefits when putting together an application. The ECU has also developed a Race Equality Charter, which aims to advance the representation and career progression of minority ethnic staff and students within higher education. In order to incorporate a broader discussion of best practice, the workshop concluded with a panel discussion focused on broadening participation and expanding the concept of diversity and inclusion. For this session, Oz Ismail and Daniel Greenwood joined the panel. Daniel is a PhD student from the Francis Crick Institute in London and was previously LGBT student representative at Magdelen College, Oxford. Oz is a final year PhD student at UCL and co-founder of the Minorities in STEM Network and he has a keen interest in increasing BAME and LGBTQ+ visibility and representation in Science. 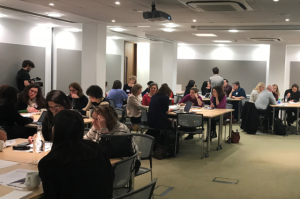 In addition, a number of workshop delegates and speakers were interviewed on why they value diversity within the biosciences and what the Athena SWAN award means to them. These interviews will soon be available on-line, as part of a collection of resources, on our diversity and inclusion webpages. If you weren’t able to attend on the day, footage of parts of the event are able to watch online. 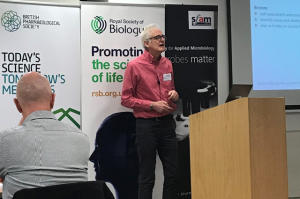 This workshop was organised in partnership with British Pharmacological Society, Biochemical society and Society for Applied Microbiology and the Physiological Society.